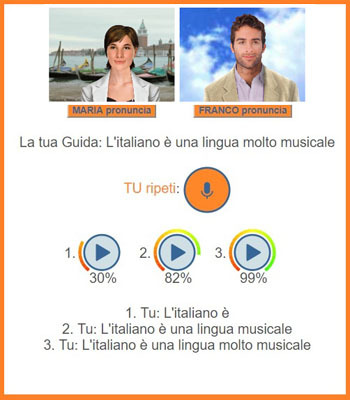 Listen and speak = you are immediately exposed to the Italian language by listening to a dialogue, practicing and recording your pronunciation, and verifying your comprehension. A glossary, pronunciation guides and a voice-recording tool are always available to help you. Learn the Culture = learn about Italian habits and culture and continue practicing your listening skills. Discover the Grammar = discover how the language and its structures work through easy grammatical explanations and charts. Exercise = make the grammar alive and put the language into use with exercises and exams; acquire the language structures and verify the results in your progress report. Some exercises may require you to give your opinion about a specific topic, describe a picture, create a dialogue, and more - creativity is allowed! The CyberItalian Method is based on a program developed for the UNSRC Circolo Culturale Italiano at the United Nations in New York. It gradually presents the basic, intermediate, and advanced structures of the Italian language through 5 basic learning steps (1.listen and speak 2.learn the culture 3.discover the grammar 4.exercise 5.have fun and reinforce). The aim of our method is to provide students with the tools to both learn the language and learn how to learn it, so they quickly become independent in discovering the mechanisms of the language and deciding how to study and practice. Some students may prefer a playful and communicative approach, others prefer a rational, analytical, or grammatical approach: our method includes all these aspects. Final Report and grades after successful completion of each Tutored Course for high school and university students. How long is the study with CyberItalian? How fast can I learn? There is no average time for learning a language because it always depends on the needs and will of the student. Each of us has a different learning and acquisition time. Each of our online lessons provides enough material to practice and study for about 3/4 hours or more. The successful completion of each Self-Study Course level (Beginner, Intermediate or Advanced) should take you from 30 to 40 hours. We recommend that you complete each Self-Study Course level in about 2 and half months (and no more than 3-4 months) to avoid long breaks between the lessons. This means studying about 1 lesson per week (including all the activities, practice, audio listening, pronunciation practice and recording, grammar studies and exercises). Some lessons may take you a little longer than others. The 1to1 Private lessons (for individuals or groups up to 6 people) are geared toward the educational needs of the student/s and it is up to the student/s to decide when they want to start or stop their personalized instruction. A teacher is always available to advise the student/s about their educational goals, to assess the progress and to discuss the structure of their studies. The minimum recommended time for the Private Lessons is 6 hours (a 6 lessons package). PLEASE NOTE: If you are looking for a course for high-school students check here. If you have any doubt or questions regarding your studies, you are not alone! With CyberItalian you have many ways to contact a professor or teacher, ask questions, and find the answers to your questions. You can contact a teacher via real-time chat, dedicated forums, or e-mail. In the CyberItalian Beginner lessons, Pinocchio (Pino for friends) introduces himself, his family and friends, and discusses familiar topics. Students learn and practice basic language structures. They learn to describe and talk about familiar topics (family, food, transportation, travel...). In this level Pino also discovers that his friends (the Cat, the Fox and Lucignolo) are not very good friends, and he wonders about friendship. In the CyberItalian Intermediate lessons, Pino travels through Italy, meets with very famous Italian people (Leonardo, Michelangelo, Rossini, etc.) and discusses cultural topics such as opera, art, literature. Students learn to narrate and to express themselves with more complex sentences. In this level Pino asks to each famous person he meets: 'Cosa è l'amicizia?' (What is friendship?). In the CyberItalian Advanced lessons, Pino continues his travel through Italy, meets with other famous Italians (Ferrari, Galileo, Machiavelli, etc. ), discusses important topics such as history, education and politics. Students learn how to write their resume in Italian, make hypothesis, refine and maintain the language using more complex structures. In this level Pino wants to grow-up and become rich and famous, even though he doesn't know what to do in life. But what is life after all? Sure, take a FREE trial NOW, and see if you like studying online. Listen to the dialogues, have fun with the Activities and practice with the Lessons and the exercises. CyberItalian Online Self-Study lessons are for all ages! 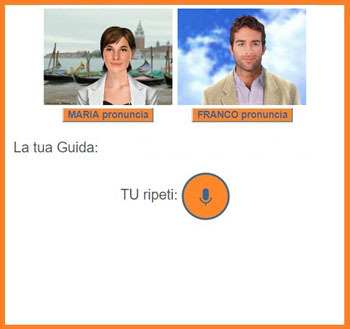 Teens and Adults: CyberItalian lessons address students with different learning needs offering playful and fun activities as well as analytical and grammatical explanations and exercises. TAKE our FREE TRIAL lessons: discover your learning approach, relax and enjoy your study online. 2) grammar, explanations, analysis, exercises, and exams. 1) Listen to the audio files provided in the lessons. Read aloud a passage from an audio file and compare the pronunciation to the original audio file. 2) Songs are one of the best ways to practice the language and pronunciation! Listen to the songs on lessons 5 and 7 and record as you sing. 4) Do especially the activity in lesson 2 (the house), 3 (describe yourself and your friends), 4 (say what you like or you don't like to do), 5 (singing), 7 (the weather), 8 (the body), 10 (clothing). Again, in these activities you are asked to listen to the sound of certain words; listen, repeat and compare your pronunciation to the original file. As for all of us (children, adults, and puppets! ), the secret to learning is: exposure, practice, and repetition. CyberItalian Tutored Courses and 1to1 Private Lessons are for dedicated students, interested in a guided study and/or grades. The nature of a Self-Study online course does not allow to check the student's identity and evaluate his/her study; for this reason an online certificate would not give appropriate credit to the level of your linguistic competence. Upon successful completion of a course, students receive the CyberItalian Certificate of Participation. PLEASE NOTE: If you are looking for a course for high-school students check here. We do not issue transcripts. Upon successful completion of at least 1 package of 6-private-lessons, and upon request, students can receive the CyberItalian Certificate of Participation. In the self-administered exercises included in the Lessons students receive an automatic score based on the percentage of correct answers. For educational purposes, these self-administered exercises can be taken several times (in this case, each time the student will have to re-enter the entire text in the exercise - which makes it a very good practice); the latest score of each exercise will be recorded over the previous one. In the self-administered exams included in the Lessons students receive an automatic score based on the percentage of correct answers; only the score of the first time you take the exam will be recorded. In the Tutored Courses the Final Exam is automatically scored based on the percentage of correct answers. In CyberItalian you find your scores in the Progress Report page. Please note: in the Lessons area, Column 2 shows the percentage of exercises completed, Column 3 reports the average score of the completed exercises. CyberItalian online registration transaction is secure and encrypted (see full key or lock at the bottom of the registration page plus the SSL Web Server Certification). The information you provide are confidential and unavailable to third parties. If you have never studied Italian (even if you understand it a little or you used to speak it as a child), you should start with a beginner course. Otherwise take a Placement Test now. Compare here our learning itineraries (courses and programs). YES! Check here for more information. Your purchase is backed by a 100% satisfaction guarantee*. We want you to be happy with our work. 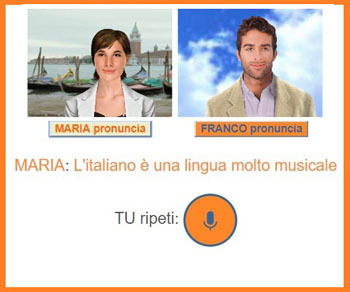 We've put a lot of work into creating what we feel is the easiest-to-use Italian language learning method online. We're proud of what we do, and we work hard to make you happy. We know that CyberItalian method delivers results and will help you learn Italian. However, if you decide within 30 days of purchase that CyberItalian is not right for you, we’ll refund 100% of your money for the self-study course, and 100% of your money for the package of private lessons or tutored courses (standard, intensive or extended) minus the cost of any private or tutored class that you might have already completed. *Please note: the refund policy for our courses for schools is different and can be discussed during or before registration. You can buy with complete peace-of-mind! If you receive a server error clear the cookies on your browser and try again. If the problem continues, please use the Contact Us form on the left (select technical support) and send a detailed report of the problem you are experiencing, along with your browser and system type. Select LOG IN and 'Forgot Password?'. Data will be sent automatically to your e-mail (the one you inserted in the CyberItalian form when you registered). busy lines or connections (if lines or connections are slow or busy, the payment transaction may be discontinued and the registration canceled. In this case, please try to register later). The Internet requires some patience at times! If you still cannot register online, contact us. Before you register with us, make sure you can use CyberItalian with your computer system: TAKE a FREE TRIAL lessons now. The following are the minimum system requirements needed to attend the Audio-Video classes in our Tutored Courses. *Downloading a software is pretty easy. However, if you are not familiar with computers and the Internet, find someone, (a relative or a friend), who can help you in setting your computer and browser properly! Please note: CyberItalian is not responsible for the location, downloading, usage and properties of the recommended softwares. The following are the minimum system requirements needed to attend the 1to1 Private Lessons. If you select a long text, the pronunciation guides will crop it to the first period, question mark or exclamation point. This is because it is better to practice the pronunciation on single words or short sentences. At this point use the recording button to record your voice and evaluate the quality of your pronunciation. Once you stop the recording, your pronunciation and evaluation will appear on the screen. Please note: this evaluation is only a reference for yourself to improve your pronunciation. It is not a score and it will not be reported in your Progress Report.